I previously wrote an article about the tools I use for GNU/Linux and photography, and mentioned the ones I personally have made the most use of. One application that was only mentioned in passing, that I felt deserved its own article, is darktable. Like many applications available on GNU/Linux systems, darktable is cross-platform, and also available on Windows and MacOS systems. 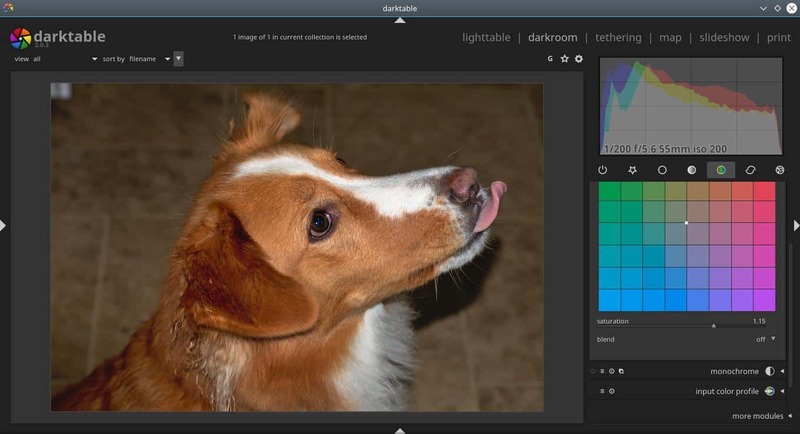 darktable is a very powerful application primarily used to edit RAW files shot on DSLR cameras. Very similar to software like UFRawr, or some aspects of Adobe Photoshop, darktable allows users to take their photos, and correct many aspects / errors / things they see, such as saturation, sharpening, exposure, highlights, shadows, etc. However, what I feel sets darktable apart from its competitors, in my opinion, is the sheer level at which you can tweak things using various modules. The one and only reason that I personally don’t use darktable, is because of its interface. I’ve never personally used lightroom, but I’m told that the darktable interface is supposed to resemble and feel like Lightroom. Remind me to never use Lightroom either. That out of the way, many people seem to enjoy it, and to each their own. I’ll say this though, I like to think I’m not half bad with a camera, but I’m far from knowing everything I could learn. There are some parts/modules that I haven’t the slightest what they do, and have had to research them / play around to learn – which isn’t something I mind, but it goes to show the sheer amount of control users have over their photos through darktable. I will say, that while I may not fully understand the deeper, low-level ways that darktable interacts with images, and all of the control it gives; I’ve managed to turn ‘okay’ photographs, into what I’d say were pretty sweet, by messing around with various modules. While there is no doubt in my mind that darktable is powerful, and in a sense, perhaps its because the power goes beyond my skill level, but I personally just do not find using it to be as easy on my workflow, as other tools. However, that is not the case for many, as darktable has proven itself a strong and worthy piece of software for amateurs and professionals alike. Now You: What are your thoughts on and experiences with darktable? Let us know in the comments! I previously wrote an article about the tools I use for GNU/Linux and photography, and mentioned the ones I personally have made the most use of. One application that was only mentioned in passing, that I felt deserved its own article, is darktable. I am no photographic expert either (and in fact I am mostly sloppy) but have looked at Darktable for it allows all the editing capabilities that I know little of. It is something I add for other person’s computers when they ask for an install, and this is the metadata editing function built in to the photo editing platform which means I think it is a complete package. I also don’t like the format due to it being a large table and taking up more space than my screens can provide. That said, I don’t use it for myself but I see its value. I also use MAT to remove my metadata. Not just that, it’s non restricted open source software which is beneficial to all because if the developer were to cease development or decide to make it not free, it could be forked and live on as oss. I use darktable for all my RAW files. Once you got the hang of it, it’s actually great! My most used function would be to batch process options all at once. Nice article and nice image used for the example. Do you suggest any tutorials suited for beginners?